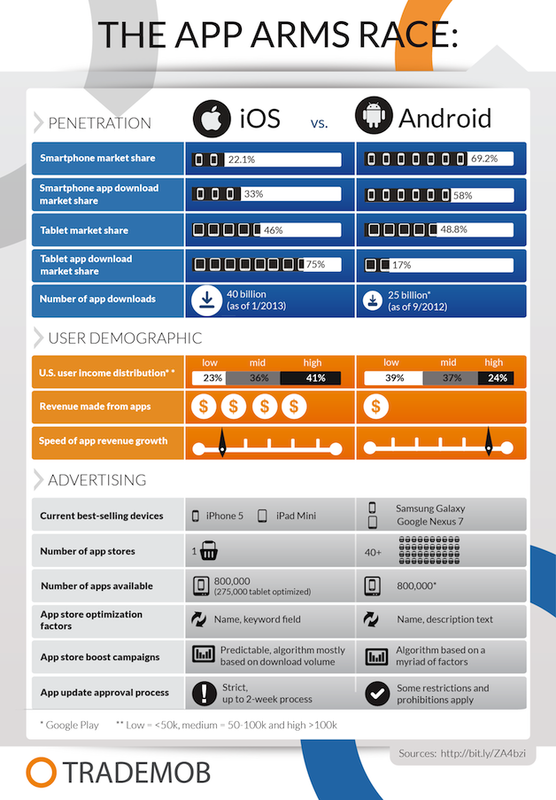 iOS vs Android, The App Arms Race. Here is an interesting little infographic for Friday. Trademob has put together a coparison between iOS and Android to see which platform really is the best for app marketers. The infographic compares the two competing operating systems looking at their user demographic, number of apps available, speed of revenue growth, smartphone market share and tablet market share, to see which OS comes out on top. Is it just me, or is this starting to feel like the “Mac vs Windows” wars of the late 1990’s and early 2000’s? Hmmm, either way, its interesting information. Posted in Android, iPad Apps, iPhone Apps, Smartphones and tagged Android, App Development, Infographic, iOS, Smartphones, Technology, Trademob on March 29, 2013 by Author. ← A Little History, and a Sneak Peek at Future Rotoscoping in After Effects.